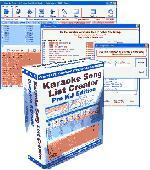 MP3 Karaoke is a freeware to create karaoke mp3 songs from your mp3 music collections. MP3 Karaoke can eliminate and remove human vocal voice from the mp3 files. It is incredibly easy and fast.